The people of Likhajan village under Vitarpawoi Village Panchayat in Tinsukia’s Margherita have decided to boycott the election as the villagers have received no help from the Assam Government to develop the village. The road conditions have become worse with the advent of monsoon. People have been forced to travel through damaged bamboo-bridges. Villagers alleged that the representative from the region to the Assam Assembly has not given any importance for the construction of the bridges and repairing the roads in the village till date. As per reports, six people died in the last seven years while they were crossing partially damaged bamboo-bridges in different parts of the village. 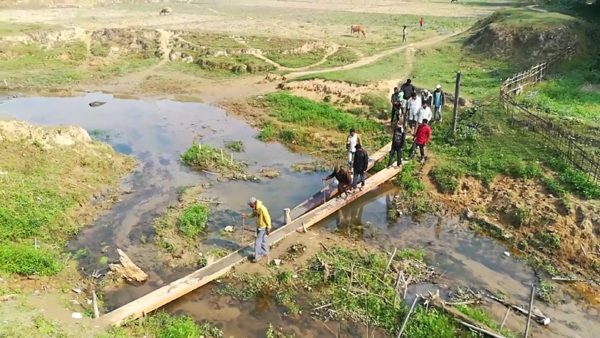 Villagers also alleged that BJP’s Dibrugarh MP Rameswar Teli during the 2016 Assam Assembly election campaign for BJP’s Margherita Legislator Bhaskar Sharma promised to construct the bridges within three months after winning the election.